Preseason wins and losses don’t matter, but preseason games do. It’s a chance for players to get realtime experience with new systems and new coaches, and for a chance for coaches to get used to their new roles. Usually, the biggest changes happen on bad teams that have cleaned house, not teams that were a muffed onside kick from the Super Bowl. But the Packers have made a big change this year, one that will be worth watching: there’s a new guy calling the plays. 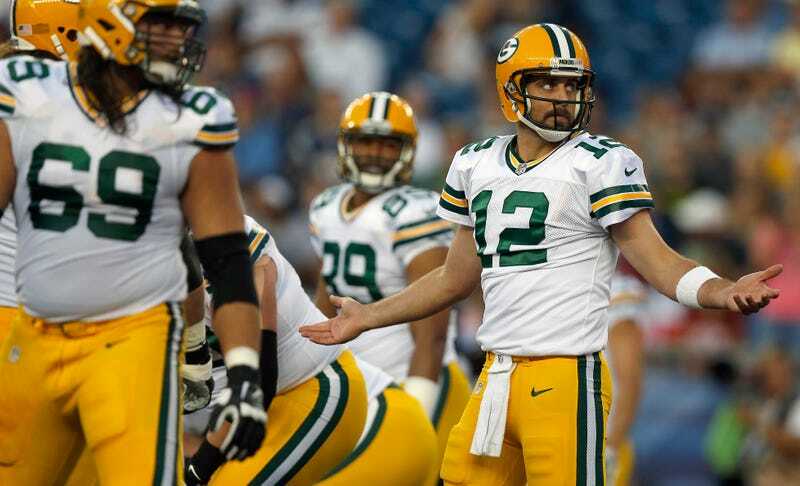 Green Bay’s offense has regularly been among the very best in the league—but it was not without problems. They struggled in the red zone as last season went on, and had issues with clock management—both things that came back to bite them in their heartbreaking NFC Championship loss. And both things could be pinned on Mike McCarthy, who was one of the minority of head coaches who also calls his team’s plays. No more. Last night’s game against the Patriots was the first since McCarthy willingly ceded play-calling duties to his newly minted assistant head coach, Tom Clements. “It was a good start for us,” said quarterback Aaron Rodgers, “Tom was very calm on the headset and he enunciated well. We had a headset issue at one point, but that’s kind of preseason. Clements comes from a distinguished line of Packers QB coaches—Steve Mariucci, Marty Mornhinweg, Andy Reid, McCarthy, and Darrell Bevell—whose jobs were made easier by coaching Brett Favre or Aaron Rodgers. Green Bay’s pass-heavy attack is a well-oiled machine, but now Clements has the keys to the whole damn thing, and it’ll be interesting to track the Packers’ offense over the course of the season to see how it goes. As for McCarthy, he’s never had so much free time. “I’m bored stiff,” he joked at halftime, and throughout the game looked a bit lost without his familiar call sheet.